My birthday is on the 25th January and I have 2 brothers. My favourite game is playing ball games. In Bhojpur life is hard for children like me. But sponsor me today and you can change my world for good. 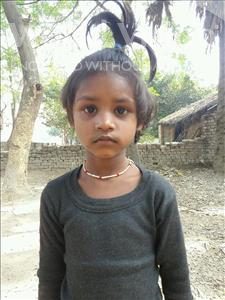 Aradhana lives in Bhojpur, India. By sponsoring her, you can help her whole community, to make it a better place for children. For children like Aradhana, growing up in Bhojpur, hunger and malnutrition are facts of life. Getting a decent education is hard because schools aren't big enough and are badly understaffed – particularly in rural areas. Children often have to work to help their families survive instead of going to school. Your sponsorship can change Aradhana's world, and her community, for good. You'll help provide livestock for families, so they can earn a decent living.